In an attempt to sail from Spain to the East Indies in 1492 for precious stones, gold, silver, and spices, Christopher Columbus is said to have “discovered” the Americas, but the Caribbean islands and parts of Central and South America that he landed upon were already inhabited by native indigenous groups. 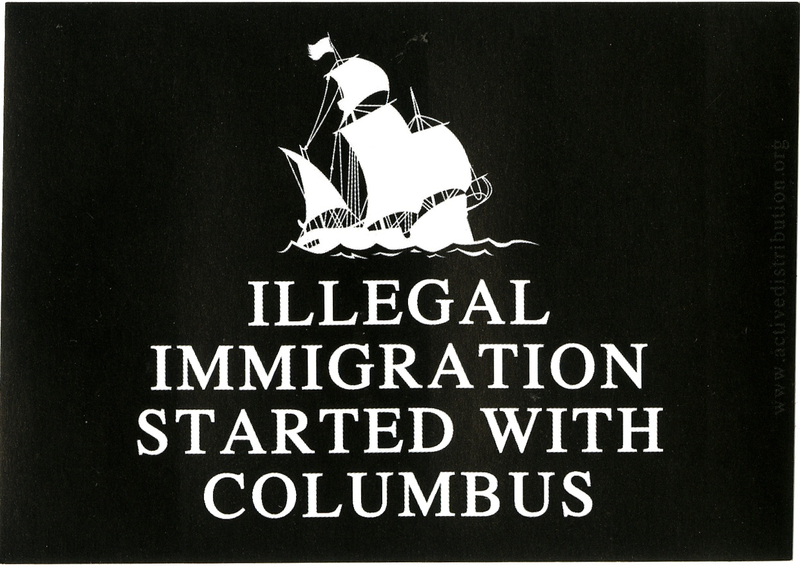 This sticker promotes the idea that Columbus was an “illegal immigrant” or “illegal alien” to the Americas, phrases that refers to people who are in a country without legal authorization. The sticker reveals a negative opinion toward Columbus with the image of a sinking ship. Columbus was responsible for the colonization and enslavement of hundreds of native people. Many historians hold Columbus accountable for genocide.